While the high capacity BRT will be operational on selected routes where substantial right of way is available, the major areas specially the inner areas and the areas approached by the internal roads will in any case continue to be served by local bus system which will act as the most important feeder system to the Metro, Mono Rail/LRT and the CRS. For this purpose the BMTC has identified East-West, North-South & diagonal grid routes along 27 corridors as already indicated in Figure 1.4. At present the BMTC is operating approximately 4500 buses at more than 1700 routes carrying approximately 35 Lakh passengers. By the year 2025, despite the fact that we are going to add Metro, Mono-rail /LRT, BRT and start CRS, still the feeder services as bus services on the other less dense corridors, will definitely be run through the city bus system only. It is expected that by 2025 at least 60 Lakh trips will be performed by buses only. For this volume of traffic at least 10000 buses will be required. However, this number may have to be increased substantially incase any of the MRT components lag behind in implementation. It is further pointed out that mere increase in fleet is not enough, its quality will also have to be of much higher standard if we want to achieve the NUTP policy of changing the passenger preference from personalized vehicles to Public Transport. Accordingly it is suggested that all the new buses to be added to fleet, either as addition or replacement should be low floor good quality buses fully considering the commuter comfort. The BMTC plans to add 2500 new vehicles and replace 1415 aged old vehicles, taking the Scheduled strength to 7000 by 2010. The financial implication towards these new vehicles is estimated as Rs 1000 Crore. In the later phases the balance 3000 buses are proposed to be added to meet the ultimate requirement of 10000 buses. 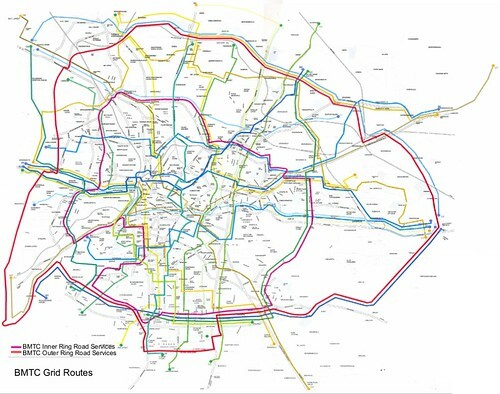 The BMTC has at present identified 27 grid routes in the North South, East and West and diagonal direction, which will meet the requirement till about 2010. Most of these grid routes are confined upto the ORR, and only a few at present transcend beyond it. However, by 2025 when the complete Development Area of more than 814 Sq. Kms proposed in BDA Master Plan gets fully occupied, these grid routes will both have to be extended upto the PRR and new routes added to serve this area. These routes will complement the Metro and BRT already proposed between the ORR and PRR. TTMC’s are planned to have multi-level parking lot, public utilities like mini-shopping centres and food courts. These centers in addition to providing park & ride facilities are also proposed to act as hubs for Mini – Buses planned by BMTC to transport the commuters from every major residential area to the nearest TTMC, so that commuters can board a bus of their choice. 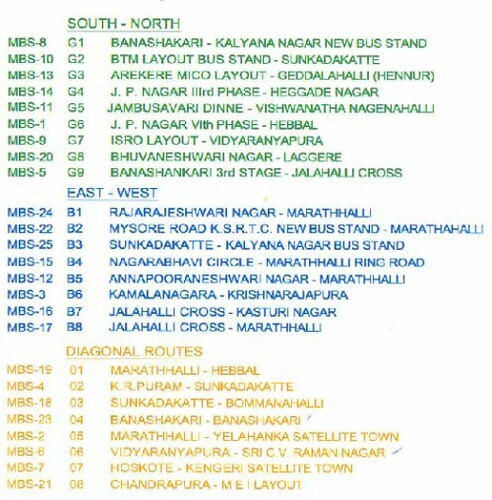 BMTC has planned such TTMC’s at the following 45 locations. Of these TTMCs at Bannerghatta, Kengeri, Domlur, Yeshwantpur, Koramangala, Vijayanagar, ITPL, Banashankari and Shantinagar are planned to be taken up very shortly. In fact quite of few these center will act as Intermodal transfer nodes and will provide logistic support to MRT modes like – METRO, Mono-rail/LRT, BRT & CRS etc. through Park & Ride as well as other facilities. In fact as the MRT network grows some additional TTMC’s may be required and in some case a slight relocation of some of the following TTMC’s may be required. In addition to the existing 24 bus depots, BMTC intends adding another 27 depots at a cost of Rs. 161 Crore to make the total number to 51 by 2010. However in order to cater to the 2025 proposed fleet size of 8000 buses, we may need another 20 depots for the additional fleet. BMTC is the first public transport undertaking in the country to use the sophisticated GPS technology for monitoring and tracking of vehicles. This is expected to cost Rs. 33 Crore. In order to provide commuter friendly information, the corporation proposes to transfer GPS generated positional details of the buses to commuters in the form of passenger information system (PIS) through display at bus stops/ bus stations also through interactive voice response system (IVRS). This is expected to cost Rs. 84 Crore. In addition introduction of Electronic Destination Boards on buses, introduction of Electronic Ticketing System, Expansion of Computerisation activity and establishment of surveillance system at a cost of Rs. 66 Crore has been proposed. Training of employees of a large staff organization such as bus system is very important. Therefore 2 hitech multi disciplinary centers (Rs. 50 crore), establishment of employee training modules (Rs. 20 crore) and establishment of employee development centers (Rs. 80 crore) have been proposed. Various environment protection measures at bus depots are being proposed such as Rain water harvesting, Installation of solar lighting system and other environmental initiatives costing around Rs. 49 crore.